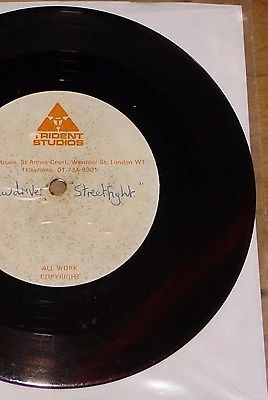 FORMAT:INCREDIBLY RARE TRIDENT ACETATE OF THE LEGENDARY, UNRELEASED, CHISWICK OI PUNK SKINHEAD CLASSIC. THIS WAS TO BE THE THIRD - AND FINAL - SINGLE RELEASE FROM THIS INFAMOUS 'OI!' OUTFIT ON CHISWICK, BUT THE SINGLE WAS NEVER RELEASED. THE BAND'S NEXT RELEASE WAS ON THE TINY MANCHESTER LABEL, 'TJM'. LABEL CONDITION GRADED ON A 1-10 SCALE:8.5. SIDE 1 GRADED ON A 1-10 SCALE:9. SIDE 2 GRADED ON A 1-10 SCALE:9. THE LABELSAREIN GREAT SHAPE WITHOUT WORRYING FAULTS. THERE ARE NO TEARS. THERE IS NO MAJOR SPINDLE WEAR. IF ANY, ALL FAULTS ARE MINOR, ACCEPTABLE, AND NOTHING TO WORRY ABOUT TOO MUCH. THEDISCIS IN GREATCONDITION WITHOUT WORRYING SURFACE MARKS. THE RECORD TESTS EXTREMELY WELL, STRAIGHT THROUGH, WITHOUT INTERRUPTION DURING PLAYBACK. NO LOSS IN SOUND QUALITYOR AURAL PERFORMANCE, AND NO OBTRUSIVE POPS OR CLICKS. BOTH SIDES CAN BE ENJOYED ENORMOUSLY.ALL FAULTS ARE ACCEPTABLE, MINOR AND NOTHING TO WORRY ABOUT. ALL IN ALL, A BEAUTIFUL EXAMPLE OF A VERY RARE RECORD AT A VERY NICE PRICE!THIS ONE IS FOR THE COLLECTION WITHOUT REASON TO UPGRADE.STRICTLY GRADED USING RECORD COLLECTOR'S GRADING SYSTEM. BID WITH COMPLETE CONFIDENCE AS TOTAL SATISFACTION IS GUARANTEED. JAPAN~ AUSTRALIA ~ REST OF THE WORLD:£12.00. APPROXIMATE DELIVERY TIMES- UK: 1-3 DAYS; EUROPE: 5-7 DAYS; REST OF THE WORLD: 7-10 DAYS. ALL PACKAGES OVERSEAS ARE SENT BY SMALL PACKET AIRMAIL. IT IS THE RESPONSIBILITY OF THE BUYER TO REQUEST ADDITIONAL COSTS. I ACCEPT CHEQUES AND POSTAL ORDERS IN UK£POUNDSSTERLING ONLY. I ACCEPT PAYMENT BY BANK TRANSFER. I ACCEPT INTERNATIONAL MONEY ORDERS AND INTERNATIONAL POSTAL ORDERS IN UK£POUNDS STERLING ONLY. IF THE WINNING BIDDER IS UNHAPPY WITH THE PRODUCT OR WITH THE SERVICE WHEN THE ITEM ARRIVES, PLEASE GET IN TOUCH BEFORE LEAVING FEEDBACK. I AM POSITIVE ALL ISSUES CAN BE RESOLVED. REGRETFULLY, OWING TO RUTHLESS EBAYERS WHO HAVE BEEN USING THE FEEDBACK FORUM DISHONESTLY, I SHALL NOW LEAVE FEEDBACK ONLY IF AND WHEN FEEDBACK HAS BEEN POSTED FOR ME.